President Kibaki used the occasion to call for stepped up support for peacebuilding efforts in Somalia and Sudan, and was joined by Ethiopian President H.E. Girma Wolde-Giorgis and representatives of the Africa Union. “We must ensure that the Comprehensive Peace Agreement for the Sudan is fully implemented,” President Kibaki said, adding that internal peace was of paramount importance as they determine the future of their country. Addressing the opening plenary, Prime Minister Raila Odinga said that besides managing conflicts, there was a need to address other root causes of disagreements. 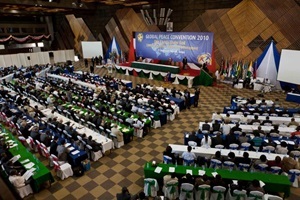 More than 1,000 participants from 40 nations attended the Global Peace Convention and International Young Leaders Summit in Nairobi, November 17-20, 2010. Seven current and former heads of state and prime ministers attended the Convention. Envoys from H.E. Tsakhiagiin Elbegdorj, President of Mongolia, and H.E. Goodluck Jonathan, President of Nigeria, delivered messages of support. Seventeen Cabinet ministers attended together with senior officials from their departments. The Convention advanced action steps to address identity-based conflict, the role of faith leaders in peacebuilding, microfinance and community-driven development, and character training as a critical component of responsible citizenship. At the opening session of the International Young Leaders Summit, Vice President Kalanzo Musyoka said it is the responsibility of leaders to preach peaceful co-existence among different ethnic communities if a united nation free from tribalism and negative ethnicity is to be realized. Dr. Hyun Jin Moon, founder and chairman of the Global Peace Foundation, spoke about the vision of One Family under God as a powerful foundation for rising above conflicts based on ethnicity or religion, and as a principle that upheld the human rights and dignity of every individual. From left, Prime Minister Raila Odinga, President Mwai Kibaki, Global Peace Foundation Chairman Dr. Hyun Jin Moon, Vice President Kalanzo Musyoka, and Nigerian Minister of State Labaran Maku on the grounds of the Kenyatta International Conference Center. Deployment of the Global Peace Youth Corps to engage young people in peacemaking and socially responsible pursuits. The Global Peace Foundation has expanded its work to include initiatives in education, community development, environmental restoration and conflict mitigation.